Some grooms aren't quirky. Some grooms are quirky. And some grooms are superduper quirky. Can you guess which one we have here? This photograph was a collaborative evolution that began as a candid moment anyone involved into a directed story. In the interest of decorum, I won't speak to the subject of the story, but I will say that it speaks to the humor of the groom and one of his best friends. This photograph also reinforces the fact that I consider myself to be an irreverent wedding photographer. This particular photograph borders on cheesy, but not if you know the groom. This image came about as the groom greeted arriving guests before the ceremony began at Holy Angels Church. 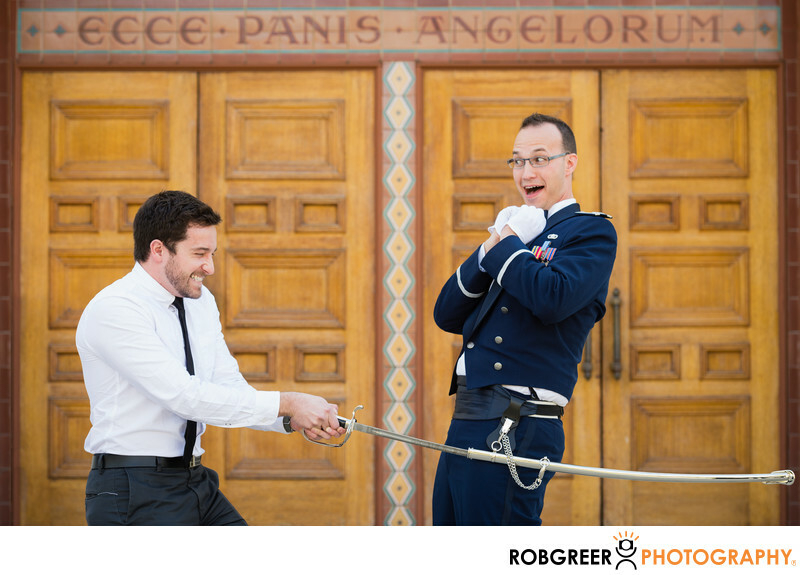 The groom's friend asked if he could pull out the sword and the groom replied, "Sure!" The groom's friend seemed unsure of himself and so I encouraged him to proceed. Then, when the sword was partially removed from its scabbard, I directed the groom's friend to look like he was trying really hard, and the groom to look happily surprised. The result is what you see in this photograph. Just in case you're curious, the Latin phrase "ecce panis angelorum" above the door translates to "behold the bread of Angels" and is occasionally inscribed near Catholic church altars. Holy Angels Church is located in Arcadia, California. Phone: (626) 447-1671. Website: http://www.holyangelsarcadia.org/. Location: 370 Campus Dr., Arcadia, CA 91007. 1/250; f/5.6; ISO 400; 98.0 mm.